makes us deaf to the Voice of Truth. Every day we deal with the voices in our heads. We can't choose what people tell us, but we can definitely choose what we keep inside our heads. We can choose what we will believe in. We can choose what to validate, accept and reject. We are our own worst critic. Worst because we live with the voices in our heads 24/7, and because when we believe what we tell ourselves, no one can tell us otherwise. Often, this voice is the echo of what the people around us say; our parents' constant reminder or comment while we were growing up, our friends who have different views from us, what the media or the society projects. Listening to the voice of discouragement makes us deaf to the Voice of Truth. It makes us forget that we are anointed to be great. We have a purpose. We can. 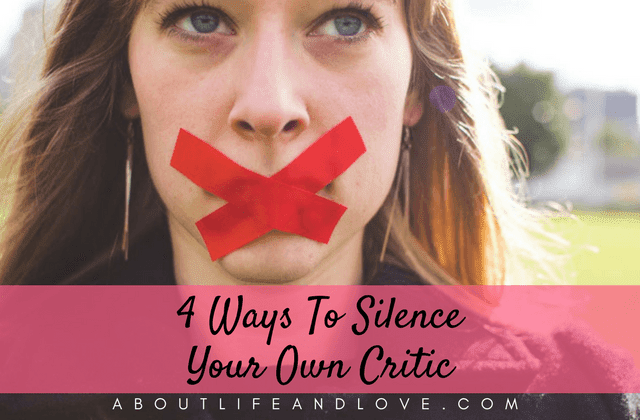 How do you silence your own critic? Know that you're not here by accident. You are fearfully and wonderfully made. You are a child of God and God does not make mistakes. If you have self-awareness, no one can change your identity for you. Be objective in receiving comments. Understand that the person saying it has a different point of view. Sometimes they may mean differently but because we are also dealing with other personal issues, we take it negatively. Remember that not everyone will agree with you or support you. No one can offend you unless you let them. Sometimes we are kind with others but we are mean with ourselves. Forgive yourself if you've failed. Give yourself the chance to correct the mistake you've done. Let go of the things and issues that are weighing you down. The voice of guilt is your loudest critic. It will tell you that you are no longer capable or qualified because of what you did in the past. Don't let one mistake define your whole life. Do not condemn yourself for one mess that you've made. Take a moment of silence and go with what your heart tells you. Go with whatever it is that will give you peace of mind. You were born with goodness planted in your heart so you feel off if something is not right. Don't numb your conscience. Don't justify the means by the end. It's important to stay connected with your inner self. Listen to your body because it manifests what you really need. It will be difficult at first to silence your own critic. It will take a lot of practice to know which voice to listen to. It will never tell you to do something that will violate you or others. The Voice of Truth will leave you pumped up and inspired. The Voice of Truth will remind you of your greatness and of your purpose and will not lead you away from it. So silence your own critic to hear The Voice of Truth more clearly. Hi, SuperLux! This is all excellent advice. I was a teenager in the 1960s and a 20-something in the 1970s. It was hard enough back then to avoid listening to my destructive inner voice and to filter out the potentially destructive voices of other people. It is even more difficult to keep peace of mind in this modern world filled with anonymous critics on social media. When I make a mistake, and I have made many of them in my lifetime, I don't wallow in shame and regret. I don't beat myself up. Instead, I frame it as a valuable learning experience and go on. Thank you for the wisdom imparted in this post, dear friend SuperLux! That is a wonderful set of comments on the subject of negativity. I read of this often, and experience it, in writing. Do people understand my point, did I stick to the subject, will I be successful in publishing, will I find an agent? Lots of self-doubt. I try to think along your advice of be silent....and then to concentrate on the positives! Interesting. I am evry self-critical, but I am also very self-confident. I guess I create my own constructive criticsm. No one can be as hard on us as we are on ourselves! This is the year I am making that inner voice a positive one! Pause to think things through is my motto. Your posts are so inspiring Lux! it makes so much sense when I read them! This is one of my inner struggles - my own critic. My inner voice often tells me I'm doing things wrong, or I don't do anything to make it better. I have to follow these steps, one by one, maybe I'll find a solution. Thanks! I silence my pathological critic by highlighting the positive things that I have done for myself and others. Carefully choosing what you think really helps you feel good. I am definitely my own worst critic, but I try not to be. Your tips are fabulous! Such a right to the pount post very true and helpful because I share it with my co-workers they said very well communicated. Great job. Don't be so hard on yourself <--- that I need to listen to and follow. Great post!!! Interesting post, so inspiring and helpful!!!! I'm totally with you on #3. I think too often we don't forgive ourselves, and how can we ever hope to succeed if we're holding a grudge over past failures? Sounds like a pattern for disaster to me. Wonderful post, thank you so much for sharing this. Good one. When critics comes from inside, just focus on the positive side of it and move on. We should know how to evaluate the risk associated with our decision on the outcome. You got excellent blog here, I'm inspired with your writings, following your blog now. Invite you to visit my blog and add in the "join this site' list. Thank you. Awesome wisdom for a Wednesday! Oh, it does take practice, but like you said..stay focused! So inspiring! I am trying to not be hard on myself right now. I am definitely the biggest critic for myself! I am never 100% pleased, always wanna do more, wanna do better, be better. So thank you for these tips, I will try my best to remember them and follow them. We're so hard on ourselves all the time. It's important to remember to give ourselves a break. Great tips! I'm so hard on myself sometimes. This year I will try and change this. I enjoyed reading this post. Hi Lux! I like the idea that we can be our own worst critic. Then when someone says something negative, it just seems like ''piling on'". I wrote once that I have to allow Jesus to come into my mind and 'cleanse the Temple'. Get rid of all those negative thoughts so I can see myself as he sees me. We are created for a purpose! I really have gathered a lot from reading this piece. Thanks awfully, Lux. Stay blessed. I just talked about this with someone. Sometimes it is easier for us to listen and hold on to negative things we hear about ourselves than the positive. We can allow the negative to completely overwhelm the positive. We must learn to renew our minds daily and believe what God says about us. Great topic, I must say! It's very hard to silence the critic----I go through this every day. But what works best for me is to keep busy and do other things that make me happy. I try not to take life too seriously as well. Humor is the best medicine. Great post! I think it's important to love yourself. Verdade! Porque além de disfarçar imperfeições ele trata a pele! Bacana essas maneiras de silenciar as críticas! Thanks for reminding me not to be too harsh on myself. I am my own worst critic and I never give myself time to relax and refresh, mentally or physically. Something I have to work on..
you are right. we are very hard on ourselves and less forgiving when we mess up. thanks for the encouraging words and for stopping by! "Don't be too harsh on yourself." Yes, many of us put pressure on ourselves to do well in everything to please ourselves or others - sometimes, it is quite all right to do not as well. Life is more than that. Great post - great words of advice. Thanks. Hi Lux! I'm happy to be here reading this very inspiring post. I love this. We are our own worst enemy sometimes. This is great advice. Great advice! Love this post! Thank you for sharing this, very good advice. We are indeed our harshest critic. I do know of these tips but sometimes it really is difficult to apply them simply because we are our harshest critic and sometimes do not allow ourselves to love ourselves more. I guess sometimes we really need to have a time out and moment of silence to listen to the calm inner voice. Thank you for stopping by my blog and leaving me a comment. See you around! The inner critic is something I have to be so careful with - I definitely give in to the negative much more than I should. God's been showing me that His plans for me are so much more important than what anyone else might have to say. Thank you for sharing techniques on dealing with that inner critic - I'm hopeful that your words encourage many! I'm stopping by from the Grace & Truth linkup - have a blessed week! I understand that we need to love ourselves but sometimes we have so much negativity around that we tend to get harsh on ourselves.. Thank you for this very relevant advice. I also take action to distract myself - e.g., write the next sentence or paragraph, no matter how lousy I feel about my abilities; or go for a jog or something. Getting the brainwaves moving in a different direction seems to help. Of course, too, there's always chocolate. Smiles. Yes! Why are we so willing to listen to the worst things about ourselves? It's crazy. I like what you said about receiving criticism and not getting angry but to learn from it. To consider if the remarks have some truth and if we need to make adjustments. Your points were well taken and I enjoyed your post very much. Thank you for visiting my site and for your sweet comments. Amen. I'm saving this, I have a feeling I'm going to need to read it again. Wonderful tips, especially #1 :)! I have a very loud, discouraging inner critic. Thank you for this much needed encouragement. Absolutely! We can be harsh taskmasters toward ourselves. If we can't show a gentle grace toward ourselves, how can we extend that to others? Great reminders. Yes, we are our own worst critic. We need to dwell on those things that are true, noble, right, pure, noble, lovely and admirable. When those thoughts come, I always ask, "Is this true? Is it right? etc. and take those thoughts captive!!! Thanks for sharing this. I don't bother much about voices from others because i myself have two voice,one which is positive and another a negative evil one talking whenever i want to do anything. Well said, SuperLux! We need to be kinder to ourselves! When someone criticizes me harshly, I try to remind myself that I am not the target, that something else is going on with the person. When the voices in my head get too loud, I drown them out with music and repeat positive things to myself. Thanks for visiting my blog today and leaving a comment that raised my spirits! Have a good one! Hi! Lovely post, we all need a little reminding sometimes! This was an amazing post to read and so helpful - like something straight out of a magazine that I'd read word for word. Thank you for sharing this. I also suffer from awful self-criticism and not the constructive kind. We are very nasty to ourselves and need to learn to be kinder and more gentle to ourselves. Thanks. I think this is something we all need and go through when writing. I know the feeling too well. I think it's good to have an inner critic, otherwise we would never improve ourselves and move forward in life. The trick is to not let it get to us and make us unhappy, and it's not always easy to find the right balance. This has been something I have dedicated myself to working on in 2015! Thanks for the steps that I can work around while I start this journey! These are wonderful words of encouragement for everyone to read. I love how you gave these gentle reminders that we all have worth and are here for a reason. Great post. Inspiring! It makes me think of the song "Voice of Truth" by Casting Crowns. I loved reading this. Definitely encouraging. This is great! I especially needed #4. Your blog is very vibrant and forward-thinking, as your many followers and commenters will attest. I also detect that you have a spiritual dimension to your life. Wonderful! Blessings to you as you spread happy vibes, Lux. Lux: Thanks for sharing your heart and wisdom with us. You have such wonderful insight to help guide us daily and to become better people. God bless! I am often hard on my self when I fail. But I heard a preacher say that a failure is not who we are but what happens to you!